Mix one part fashion sense with two parts high-tech wizardry and you get Sony's VAIO Pro 13. If you're looking for a notebook that will turn heads when your manicured fingers slide it out of your Gucci messenger bag, this is the Ultrabook to buy. In all seriousness, you needn't worry that the VAIO Pro is all style and no substance. This amazingly light machine can handle just about any task other than hard-core games (due to its reliance on integrated graphics). While the configuration Sony sent us for review has only a Core i5-4200U processor and just 4GB of DDR3/1600 memory (just like Lenovo uses in its much-cheaper IdeaPad U430 Touch), the VAIO Pro also has a 128GB SSD to help level the playing field. And where Lenovo provides a 1600-by-900-pixel panel, Sony goes the full Monty with a gorgeous 1920-by-1080-pixel display that benefits from Sony's expertise in designing and manufacturing HDTVs. The VAIO Pro's chassis is enveloped in carbon fiber and looks sharp enough to slice a roast. Sony's VAIO logo, rendered in chrome, is embedded in the lid, and there's a chrome accent strip on its back edge. When fully open, the bottom of the lid nicely elevates the rear of the computer, putting its keyboard at the perfect typing angle. The backlit, island-style keyboard has well-spaced keys that are completely flat, which might take touch-typists some getting used to, as will the half-sized arrow keys beneath the shift key. 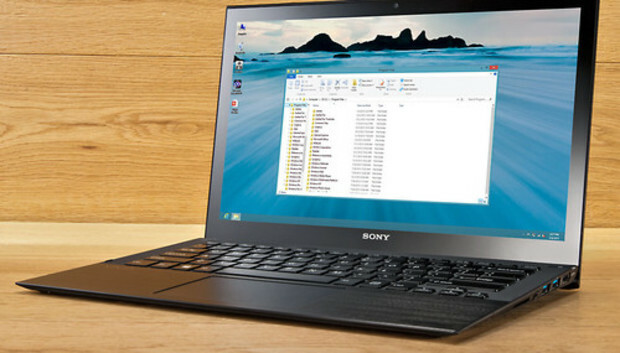 Press the Assist button at the top of the keyboard, and you're greeted with Sony's VAIO Care utility, which offers helpful, if basic, troubleshooting advice. HP's Envy TouchSmart 15t produced a higher Notebook Worldbench score than the VAIO, but that's because the Envy is equipped with a Core i7 processor and 8GB of memory. Like I said, the VAIO's SSD does a lot to level the playing field. But the SSD doesn't help much with gaming performance. On that score, the VAIO gets trounced by notebooks that have discrete graphics processors. And the flipside of relying on an SSD is that you have limited onboard storage--just 128GB in this case--so you might want to carry an external drive or rely on cloud storage. The VAIO 13 Pro has only enough real estate on its right side to accommodate a headset jack, an SD card reader, HDMI out, and a pair of USB ports (both of which are USB 2.0). The left side is occupied by a vent. Speaking of vents, this computer is completely silent. All I could hear when I put my ear right next to the vent was the soft whoosh of air in motion. Freed from powering a mechanical hard drive and a discrete graphics processor, the battery in the VAIO Pro ran for an impressive 6 hours and 14 minutes before it conked out. But the VAIO Pro's most impressive spec is its weight: At 2.34 pounds, it weighs less than the Toshiba Qosmio X75's power supply. Note: This review was written as part of a roundup of the 5 best Haswell notebooks as of September 2013.